Done. They fit. They stay snug. It’s a wrap. Onto the next project. This entry was posted in lace knitting, toe-up socks, Winter Games Challenge on February 23, 2014 by DianaTwiss. I have been making good progress on these socks. It has been a creative marathon. When I first imagined doing this I thought I would simply increase the number of purl stitches in the purl ditches separating the lace columns. But I didn’t like that look and besides, I wanted all the increasing to happen at the back of the leg. So this is what I did – as I approached the bottom of the calf, I went up a needle size from 2.75 mm to 3 mm. Then I “grew” another column of lace stitches out of the purl ditch on either side of the central lace column at the back of the leg. After knitting 1.5 inches, I increased another 4 stitches in the purl ditches at the back of the leg. Total increase – 14 stitches. And I think the look is just fine. (When fully complete, I’ll take photos of them on so you can see the effect.) 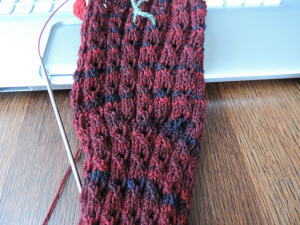 As I get near the top of the sock, before I start the edging rib stitches, I have decreased the four purl increases. I will decrease another five to bring it to 70 stitches. Then using 2.75 mm needles again, I will knit 2 inches of 1 x 1 rib, cast off loosely and call it a day. I’ve been knitting these socks in tandem so I could make the necessary pattern modifications and still end up with matching socks. Sock #1 is waiting for me to start the 1 x 1 rib. 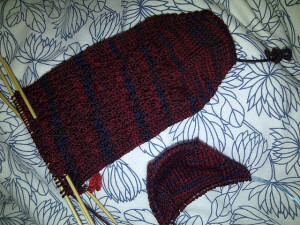 Sock #2 is still being knit in pattern with all the increases in. I have two more pattern repeats and then the decreases, and then the 1 x 1 rib. I am planning to finish these up as I watch several episodes of Lidia’s Italy . Here’s a snapshot of the two columns of lace increases across the back. This entry was posted in knitting, lace knitting, toe-up socks, Winter Games Challenge on February 22, 2014 by DianaTwiss. FibresWest 2014 is coming up on Friday, March 21 and Saturday, March 22 in at the Cloverdale Fair Grounds in Surrey, BC. The event runs from 9:30 am to 6 pm on both days. Admission is $8, seniors and students get in for $6. And kids under 13 are free. It’s a great fibre event. This year is their 6th Annual and each year there are more vendors, more classes and more excitement. Coming a near 1/2 year after Knit City, it’s just the fibre fix we need to get us through the year. 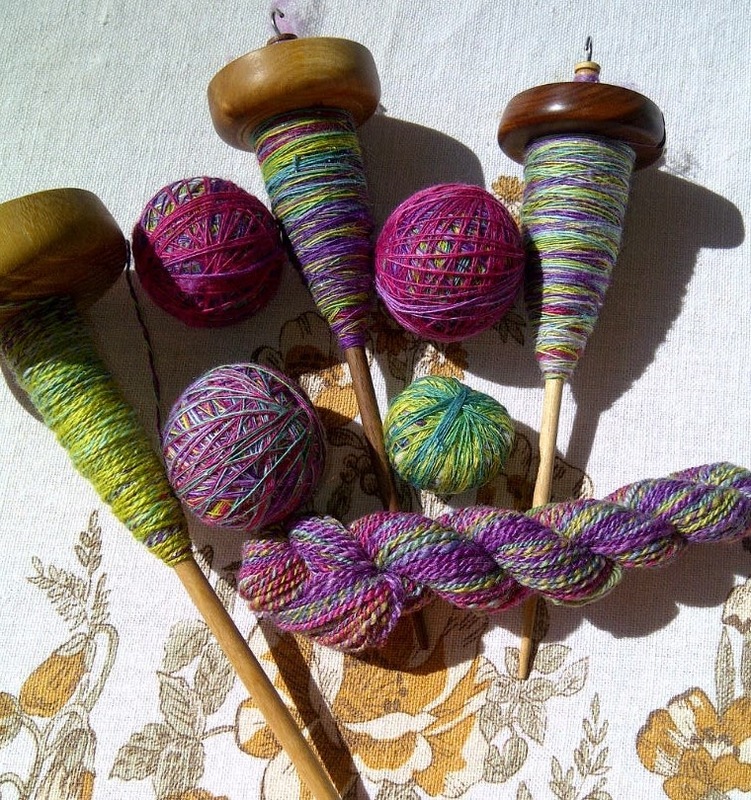 This year I am teaching an Introduction to Spindle Spinning on Friday morning. And on Saturday morning I am teaching an Advanced Spindle Spinning Class. Please visit FibresWest 2014 for all the details about these (and other) classes. Hope to see you there! This entry was posted in drop spinning, fibreswest 2014, Houndesign, spinning workshop on February 10, 2014 by DianaTwiss. This month I’ve joined my local yarn shop in their celebrations of the Sochi Winter Olympics. They are hosting a knit/crochet challenge that has three levels of competitions: Gold, Silver and Bronze, along with several other wonderful prizes for participants. To join in, you needed to identify your project before midnight on Thursday and couldn’t start knitting until the Opening Ceremony began at 8:14am Pacific Time. 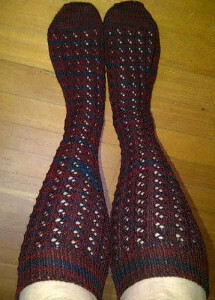 The project I identified was a pair of knee-high lace-rib socks. The pattern is toe-up, something I’ve never done before, and while the pattern is only for mid-calf and my friend wants knee high. Because of this, my project has been put into the Gold (Moscow Biathlon Participants) category. I had the yarn picked out and had swatched prior to the official starting time. This photo shows how far I’ve come in two days. Because I am making modifications to the pattern I am knitting these in tandem. Toe for sock #1, then over to the toe for sock #2. What you see here is one toe complete, and on the other sock, the foot, nearly up to the place to start the heel. When I get to that point, I’ll stop, and start on the second sock. Then I turn the heels at the same time and will be able to do the shaping for the calves at the same time. The foot for these socks need to be 9.5 inches long, and the leg 16.25 inches high, add 2 inches for the heel and each sock represents about . That’s 28 inches (27.75) for each sock a total of 56 inches. If there are 17 days of knitting to be had during the Olympics, then that means that I need to do a minimum of 3.3 inches on these socks every day to stay on track for a completion before the closing ceremonies. I think that’s manageable. This afternoon I am going to plunk myself in front of the TV and watch about 7 episodes of Lidia’s Italy and Lidia in America, drink wine and knit these socks. That’s my idea of a Sunday afternoon. This entry was posted in knitting, toe-up socks, Winter Games Challenge on February 9, 2014 by DianaTwiss. Here is the yarn I am going to use as the weft for my scarf. The colourway is London Town, it’s from the Sweet Georgia Yarns fibre club. The fibre blend is called Panda – Merino 60%; Bamboo 30% and Nylon 10%. Lovely, soft, silky and with an excellent drape. And at 420 yards, there is plenty for a scarf. I spun this up during the Spinzilla contest. It was the last full braid I completed. Newly plied yarn in a skein, ready for a bath. Now I just have to finish dressing the loom, and then can get started on the weaving. I haven’t made any additional progress on dressing it since my blog post about it. And tomorrow the knitting Olympics start, so not sure what kind of effort I’ll have for weaving. This entry was posted in handspun yarn, weaving, weft on February 6, 2014 by DianaTwiss. Sometime back in March 2013 (was it really that long ago?) I spun up the February Fibre club yarn called Candygram. It is lovely stuff with just a wee bit of sparkle – not enough to make it tacky, but enough to make it special. Recovering from a spinning-inspired knee injury, I spun this 100 grams on my drop spindles. You can find all the info about this fibre and the spinning in this blog post. Once it was spun up I stared at the yarn for a long time. I just didn’t like it. I didn’t like the purples and lime greens together and thought they’d look muddy when knit up. Well I was wrong. Really wrong. This was a case of ugly yarn, lovely result. The yarn actually striped up when it was knit, and even those rare times when the greens and purples collided, it was actually okay. So here they are, a pair of socks. Just my basic “mindless-knitting” sock pattern. They aren’t exactly the same, but they surely are a pair. Just to make sure I didn’t get SSS (second-sock syndrome) I knit them mostly together. 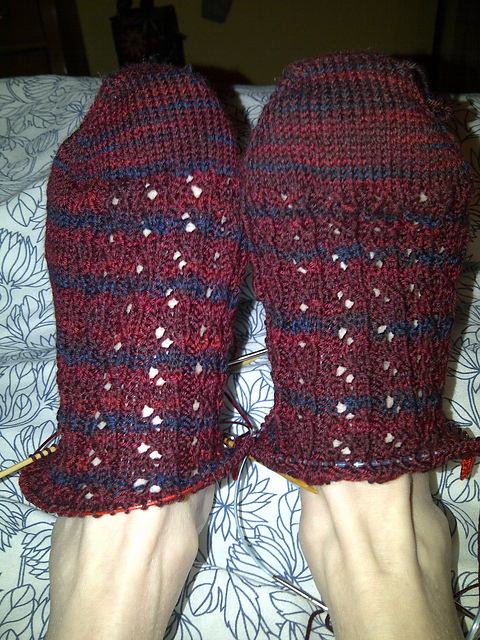 Cuff on #1, cuff on #2. heel flap on #1, heel flap on #2, and so on right down to the decreases at the toe. 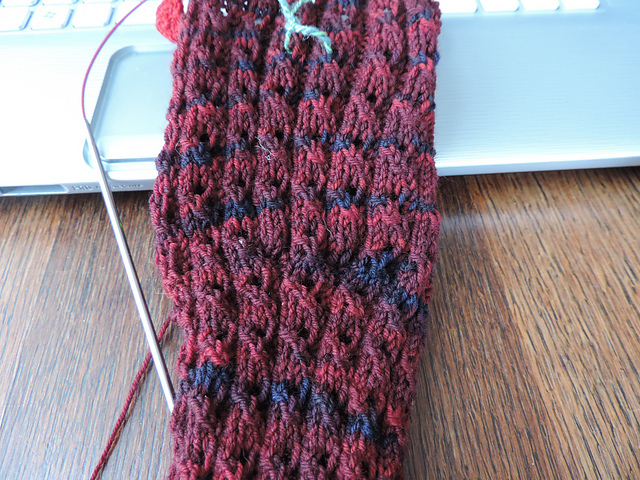 I recommend doing socks this way — it’s easy to remember the pattern when you are doing on piece following another. And for me, I know that once I saw the result of the yarn, the mystery was over and I could easy be left with just one sock. Nope, not now. I now have a lovely pair of socks to show off at the next fibre event! This entry was posted in drop spinning, fibre club, handspun yarn, knitting, socks, Sweet Georgia Yarns on February 5, 2014 by DianaTwiss. I started this project in October 2011. Inspired after a spinning workshop with Abby Franquemont, who had plans to make her own pair of jeans from hand woven fabric from her own hand spun cotton, I thought I could do something similar. I was in love with the Claudia Evilla skirt. While a bit of a knitting marathon, it was an easy knit. I had made one already, knew that the style looked good on my shape, and knew roughly how much yarn it would take. So I started. Through the course of 2011, 2012, and yikes, 2013 I blogged about it. I combed the alpaca, spun 4 sets of singles, plied the yarn and then plied it again to make a strong cabled yarn that could withstand the wear and tear that a skirt, especially the bottom, gets. And then I started knitting. I ran out of yarn and had to go back to the combing, spinning, and plying. I combed all the alpaca I had, make all the yarn I could make and got back to knitting. And then I was stuck. Stuck because I just didn’t have a good plan B if I ran out of yarn. Fast forward to late December 2013. Local Yarn Store 88 Stitches hosted a KAL (knit along) on Ravelry to help us finish UFOHs (Unfinished Objects with Hope). Among the three things I listed, one of them was the 100-mile skirt. And I finished it. All that worrying about plan B was all for naught. I ended up with a small ball of yarn about the size of a loonie, 8 metres to spare. And here are some photos of the finished, washed and worn skirt. It is an incredibly warm skirt. And the fact that it requires a second layer under it because of the lace. . . . well, I’ll only be wearing it in January and February. We’re moving into a wee cold spell here in so I’ll wear it to work this week. Here’s a photo of it being blocked. After it mostly dried, I hung it over the stove to finish it off and to get the drape going. The first time I wore it, it was full of static. It bunched around my legs and drove me crazy. I was so upset! After all that work and the damned thing is full of static!?!! Then whilst in the laundry aisle looking for something to remove hair dye from upholstery, I saw something from my past called “Static Guard”. INSTANTLY ELIMINATES STATIC CLING! was the claim. I bought it. And yes, it has saved me and my skirt from annoying static cling. I wore it yesterday to an event at 88 Stitches and was happily reminded about how much I love this skirt. It flows beautifully, is the perfect length, and yes, I have the satisfaction that I made the entire thing. This entry was posted in 100-mile clothing, Abby Franquemont, alpaca on February 2, 2014 by DianaTwiss.